Listen to "Never Be Sick Again: Health Is a Choice, Learn How to Choose It" on your iOS and Android device. One day Raymond Francis, a chemist and graduate of MIT, found himself in a hospital, battling for his life. The diagnosis was acute chemical hepatitis, chronic fatigue, multiple chemical sensitivities, and several autoimmune syndromes, causing him to suffer fatigue, dizziness, impaired memory, heart palpitations, diarrhea, numbness, seizures, and numerous other ailments. Knowing death was imminent unless he took action, Francis decided to research solutions for his disease himself. His findings and eventual recovery led him to conclude that almost all disease can be both prevented and reversed. 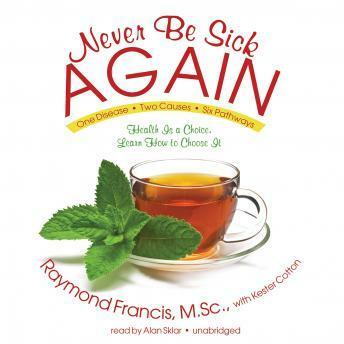 In Never Be Sick Again, Francis presents a seminal work based on these findings&apos;a revolutionary theory of health and disease: there is only one disease (malfunctioning cells), only two causes of disease (deficiency and toxicity), and six pathways to health and disease (nutrition, toxins, psychological, physical, genetic, and medical). This remarkable book answers the questions, what is health? what is disease? why do people get sick? how can disease be prevented? and how can it be reversed? It will teach listeners, in one easy lesson, an entirely new way to look at health and disease with an approach that is easy to understand yet so powerful that they may, indeed, never have to be sick again. Providing a basic understanding of health and disease, this book takes the mystery out of disease. It provides listeners, no matter what their present physical condition, with a holistic approach to living that will empower them to get well&apos;and stay well. I thoroughly enjoyed this book. Very informative, concise and most of all very relevant to every single person who wants to live a life of true health. I highly recommend it.